Gionee has announced Gionee Pioneer P3 in India, which is a budget Quad core smartphone priced at only Rs. 7,499. The phone is the successor of Dual core Gionee Pioneer p2 and apart from 2 extra processor cores rest of the specifications remains similar. The phone is powered by 1.3 GHz Quad core processor backed by Mali 400MP GPU, similar to what was unveiled in Intex Aqua i6. Most probably the processor employed is Mediatek MT6582, based on 28nm process technology and Cortex A7 architecture. The RAM capacity is only 512 MB and internal storage is standard 4 GB. You can further extend the storage to 32 GB using MicroSD card support. The display size has been slightly increased from Pioneer P2. The 4.3 inch display in this smartphone sports WVGA resolution which will give you pixel density of 217 ppi which implies softer texts. 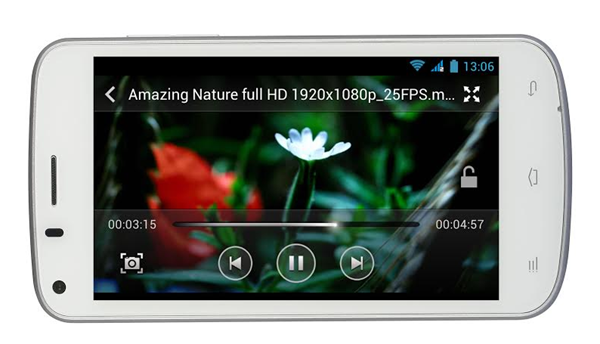 On the software front this phone comes with Android 4.2 jelly bean operating system for decent android experience. The OTA (Over the Air) software updates are also supported. The primary camera is of 5 MP and is capable of HD video recording. The LED flash is also present for low light photography. The secondary camera of 0.3 MP is also present for video calling. The Battery capacity is 1700 mAh and Gionee claims, this will give you talk time of 8 to 12 hours which is pretty good. The standby time has been states as 10 to 12 days. Connectivity features include Bluetooth with A2DP, 3G, GPRS, and GPS with AGPS Support. The Phone also supports Dual SIM Dual Standby functionality and comes with a Digital compass. The Specs seem pretty satisfactory on paper for a budget Android phone but the limited RAM capacity will put a cap on the performance to shadow the extra processing power. For basic usage, this phone is expected to perform pretty well. gionee p3 ppi is 217..
can you tell me how much it is for pioneer p2 please..? ?